Structure of the antioxidant glutathione. Antioxidants are compounds that inhibit oxidation. Oxidation is a chemical reaction that can produce free radicals, thereby leading to chain reactions that may damage the cells of organisms. Antioxidants such as thiols or ascorbic acid (vitamin C) terminate these chain reactions. To balance the oxidative state, plants and animals maintain complex systems of overlapping antioxidants, such as glutathione and enzymes (e.g., catalase and superoxide dismutase), produced internally, or the dietary antioxidants vitamin C, and vitamin E.
The term "antioxidant" is mostly used for two entirely different groups of substances: industrial chemicals that are added to products to prevent oxidation, and naturally occurring compounds that are present in foods and tissue. The former, industrial antioxidants, have diverse uses: acting as preservatives in food and cosmetics, and being oxidation-inhibitors in fuels. Antioxidant dietary supplements have not been shown to improve health in humans, or to be effective at preventing disease. Supplements of beta-carotene, vitamin A, and vitamin E have no positive effect on mortality rate or cancer risk. Additionally, supplementation with selenium or vitamin E do not reduce the risk of cardiovascular disease. Although certain levels of antioxidant vitamins in the diet are required for good health, there is still considerable debate on whether antioxidant-rich foods or supplements have anti-disease activity. Moreover, if they are actually beneficial, it is unknown which antioxidants are health-promoting in the diet and in what amounts beyond typical dietary intake. Some authors dispute the hypothesis that antioxidant vitamins could prevent chronic diseases, and others declare that the hypothesis is unproven and misguided. Polyphenols, which have antioxidant properties in vitro, have unknown antioxidant activity in vivo due to extensive metabolism following digestion and little clinical evidence of efficacy. Although dietary antioxidants have been investigated for potential effects on neurodegenerative diseases, such as Alzheimer's disease and Parkinson's disease, the studies had poor design and there was no evidence of effect, except for maintaining normal levels of vitamin C to lower the risk of cognitive deficits during aging. Common pharmaceuticals (and supplements) with antioxidant properties may interfere with the efficacy of certain anticancer medication and radiation. A 2016 systematic review examined allopurinol and acetylcysteine as possible add-on treatments for schizophrenia. Tirilazad, a steroid derivative that inhibits lipid peroxidation, was shown in human trials to have no effect on mortality or other outcomes in subarachnoid haemorrhage and worsened results in ischemic stroke. Structure of the metal chelator phytic acid. Relatively strong reducing acids can have antinutrient effects by binding to dietary minerals such as iron and zinc in the gastrointestinal tract and preventing them from being absorbed. Examples are oxalic acid, tannins and phytic acid, which are high in plant-based diets. Calcium and iron deficiencies are not uncommon in diets in developing countries where less meat is eaten and there is high consumption of phytic acid from beans and unleavened whole grain bread. High doses of some antioxidants may have harmful long-term effects. The beta-carotene and Retinol Efficacy Trial (CARET) study of lung cancer patients found that smokers given supplements containing beta-carotene and vitamin A had increased rates of lung cancer. Subsequent studies confirmed these adverse effects. These harmful effects may also be seen in non-smokers, as one meta-analysis including data from approximately 230,000 patients showed that β-carotene, vitamin A or vitamin E supplementation is associated with increased mortality, but saw no significant effect from vitamin C. No health risk was seen when all the randomized controlled studies were examined together, but an increase in mortality was detected when only high-quality and low-bias risk trials were examined separately. As the majority of these low-bias trials dealt with either elderly people, or people with disease, these results may not apply to the general population. This meta-analysis was later repeated and extended by the same authors, with the new analysis published by the Cochrane Collaboration; this analysis confirmed the previous results. These two publications are consistent with some previous meta-analyzes that also suggested that Vitamin E supplementation increased mortality, and that antioxidant supplements increased the risk of colon cancer. Beta-carotene may also increase lung cancer. Overall, the large number of clinical trials carried out on antioxidant supplements suggest that either these products have no effect on health, or that they cause a small increase in mortality in elderly or vulnerable populations. The structure of the antioxidant vitamin ascorbic acid (vitamin C). A paradox in metabolism is that, while the vast majority of complex life on Earth requires oxygen for its existence, oxygen is a highly reactive molecule that damages living organisms by producing reactive oxygen species. Consequently, organisms contain a complex network of antioxidant metabolites and enzymes that work together to prevent oxidative damage to cellular components such as DNA, proteins and lipids. In general, antioxidant systems either prevent these reactive species from being formed, or remove them before they can damage vital components of the cell. However, reactive oxygen species also have useful cellular functions, such as redox signaling. Thus, the function of antioxidant systems is not to remove oxidants entirely, but instead to keep them at an optimum level. The reactive oxygen species produced in cells include hydrogen peroxide (H2O2), hypochlorous acid (HClO), and free radicals such as the hydroxyl radical (·OH) and the superoxide anion (O2−). The hydroxyl radical is particularly unstable and will react rapidly and non-specifically with most biological molecules. This species is produced from hydrogen peroxide in metal-catalyzed redox reactions such as the Fenton reaction. These oxidants can damage cells by starting chemical chain reactions such as lipid peroxidation, or by oxidizing DNA or proteins. Damage to DNA can cause mutations and possibly cancer, if not reversed by DNA repair mechanisms, while damage to proteins causes enzyme inhibition, denaturation and protein degradation. The use of oxygen as part of the process for generating metabolic energy produces reactive oxygen species. In this process, the superoxide anion is produced as a by-product of several steps in the electron transport chain. Particularly important is the reduction of coenzyme Q in complex III, since a highly reactive free radical is formed as an intermediate (Q·−). This unstable intermediate can lead to electron "leakage", when electrons jump directly to oxygen and form the superoxide anion, instead of moving through the normal series of well-controlled reactions of the electron transport chain. Peroxide is also produced from the oxidation of reduced flavoproteins, such as complex I. However, although these enzymes can produce oxidants, the relative importance of the electron transfer chain to other processes that generate peroxide is unclear. In plants, algae, and cyanobacteria, reactive oxygen species are also produced during photosynthesis, particularly under conditions of high light intensity. This effect is partly offset by the involvement of carotenoids in photoinhibition, and in algae and cyanobacteria, by large amount of iodide and selenium, which involves these antioxidants reacting with over-reduced forms of the photosynthetic reaction centres to prevent the production of reactive oxygen species. Antioxidants are classified into two broad divisions, depending on whether they are soluble in water (hydrophilic) or in lipids (lipophilic). In general, water-soluble antioxidants react with oxidants in the cell cytosol and the blood plasma, while lipid-soluble antioxidants protect cell membranes from lipid peroxidation. These compounds may be synthesized in the body or obtained from the diet. The different antioxidants are present at a wide range of concentrations in body fluids and tissues, with some such as glutathione or ubiquinone mostly present within cells, while others such as uric acid are more evenly distributed (see table below). Some antioxidants are only found in a few organisms and these compounds can be important in pathogens and can be virulence factors. The relative importance and interactions between these different antioxidants is a very complex question, with the various antioxidant compounds and antioxidant enzyme systems having synergistic and interdependent effects on one another. The action of one antioxidant may therefore depend on the proper function of other members of the antioxidant system. The amount of protection provided by any one antioxidant will also depend on its concentration, its reactivity towards the particular reactive oxygen species being considered, and the status of the antioxidants with which it interacts. Some compounds contribute to antioxidant defense by chelating transition metals and preventing them from catalyzing the production of free radicals in the cell. Particularly important is the ability to sequester iron, which is the function of iron-binding proteins such as transferrin and ferritin. Selenium and zinc are commonly referred to as antioxidant nutrients, but these chemical elements have no antioxidant action themselves and are instead required for the activity of some antioxidant enzymes, as is discussed below. Uric acid is by far the highest concentration antioxidant in human blood. Uric acid (UA) is an antioxidant oxypurine produced from xanthine by the enzyme xanthine oxidase, and is an intermediate product of purine metabolism. In almost all land animals, urate oxidase further catalyzes the oxidation of uric acid to allantoin, but in humans and most higher primates, the urate oxidase gene is nonfunctional, so that UA is not further broken down. The evolutionary reasons for this loss of urate conversion to allantoin remain the topic of active speculation. The antioxidant effects of uric acid have led researchers to suggest this mutation was beneficial to early primates and humans. Studies of high altitude acclimatization support the hypothesis that urate acts as an antioxidant by mitigating the oxidative stress caused by high-altitude hypoxia. Uric acid has the highest concentration of any blood antioxidant and provides over half of the total antioxidant capacity of human serum. Uric acid's antioxidant activities are also complex, given that it does not react with some oxidants, such as superoxide, but does act against peroxynitrite, peroxides, and hypochlorous acid. Concerns over elevated UA's contribution to gout must be considered as one of many risk factors. By itself, UA-related risk of gout at high levels (415–530 μmol/L) is only 0.5% per year with an increase to 4.5% per year at UA supersaturation levels (535+ μmol/L). Many of these aforementioned studies determined UA's antioxidant actions within normal physiological levels, and some found antioxidant activity at levels as high as 285 μmol/L. Ascorbic acid or "vitamin C" is a monosaccharide oxidation-reduction (redox) catalyst found in both animals and plants. As one of the enzymes needed to make ascorbic acid has been lost by mutation during primate evolution, humans must obtain it from the diet; it is therefore a vitamin. Most other animals are able to produce this compound in their bodies and do not require it in their diets. 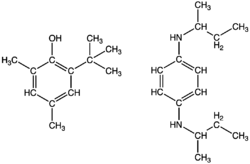 Ascorbic acid is required for the conversion of the procollagen to collagen by oxidizing proline residues to hydroxyproline. In other cells, it is maintained in its reduced form by reaction with glutathione, which can be catalysed by protein disulfide isomerase and glutaredoxins. Ascorbic acid is a redox catalyst which can reduce, and thereby neutralize, reactive oxygen species such as hydrogen peroxide. In addition to its direct antioxidant effects, ascorbic acid is also a substrate for the redox enzyme ascorbate peroxidase, a function that is particularly important in stress resistance in plants. Ascorbic acid is present at high levels in all parts of plants and can reach concentrations of 20 millimolar in chloroplasts. The free radical mechanism of lipid peroxidation. 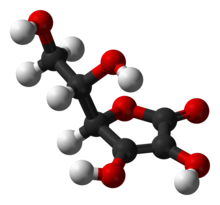 Glutathione is a cysteine-containing peptide found in most forms of aerobic life. It is not required in the diet and is instead synthesized in cells from its constituent amino acids. Glutathione has antioxidant properties since the thiol group in its cysteine moiety is a reducing agent and can be reversibly oxidized and reduced. In cells, glutathione is maintained in the reduced form by the enzyme glutathione reductase and in turn reduces other metabolites and enzyme systems, such as ascorbate in the glutathione-ascorbate cycle, glutathione peroxidases and glutaredoxins, as well as reacting directly with oxidants. Due to its high concentration and its central role in maintaining the cell's redox state, glutathione is one of the most important cellular antioxidants. In some organisms glutathione is replaced by other thiols, such as by mycothiol in the Actinomycetes, bacillithiol in some Gram-positive bacteria, or by trypanothione in the Kinetoplastids. Vitamin E is the collective name for a set of eight related tocopherols and tocotrienols, which are fat-soluble vitamins with antioxidant properties. Of these, α-tocopherol has been most studied as it has the highest bioavailability, with the body preferentially absorbing and metabolising this form. It has been claimed that the α-tocopherol form is the most important lipid-soluble antioxidant, and that it protects membranes from oxidation by reacting with lipid radicals produced in the lipid peroxidation chain reaction. This removes the free radical intermediates and prevents the propagation reaction from continuing. This reaction produces oxidised α-tocopheroxyl radicals that can be recycled back to the active reduced form through reduction by other antioxidants, such as ascorbate, retinol or ubiquinol. This is in line with findings showing that α-tocopherol, but not water-soluble antioxidants, efficiently protects glutathione peroxidase 4 (GPX4)-deficient cells from cell death. GPx4 is the only known enzyme that efficiently reduces lipid-hydroperoxides within biological membranes. However, the roles and importance of the various forms of vitamin E are presently unclear, and it has even been suggested that the most important function of α-tocopherol is as a signaling molecule, with this molecule having no significant role in antioxidant metabolism. The functions of the other forms of vitamin E are even less well understood, although γ-tocopherol is a nucleophile that may react with electrophilic mutagens, and tocotrienols may be important in protecting neurons from damage. Antioxidants that are reducing agents can also act as pro-oxidants. For example, vitamin C has antioxidant activity when it reduces oxidizing substances such as hydrogen peroxide, however, it will also reduce metal ions that generate free radicals through the Fenton reaction. The relative importance of the antioxidant and pro-oxidant activities of antioxidants is an area of current research, but vitamin C, which exerts its effects as a vitamin by oxidizing polypeptides, appears to have a mostly antioxidant action in the human body. However, less data is available for other dietary antioxidants, such as vitamin E, or the polyphenols. Likewise, the pathogenesis of diseases involving hyperuricemia likely involve uric acid's direct and indirect pro-oxidant properties. That is, paradoxically, agents which are normally considered antioxidants can act as conditional pro-oxidants and actually increase oxidative stress. Besides ascorbate, medically important conditional pro-oxidants include uric acid and sulfhydryl amino acids such as homocysteine. Typically, this involves some transition-series metal such as copper or iron as catalyst. The potential role of the pro-oxidant role of uric acid in (e.g.) atherosclerosis and ischemic stroke is considered above. Another example is the postulated role of homocysteine in atherosclerosis. Enzymatic pathway for detoxification of reactive oxygen species. As with the chemical antioxidants, cells are protected against oxidative stress by an interacting network of antioxidant enzymes. Here, the superoxide released by processes such as oxidative phosphorylation is first converted to hydrogen peroxide and then further reduced to give water. This detoxification pathway is the result of multiple enzymes, with superoxide dismutases catalysing the first step and then catalases and various peroxidases removing hydrogen peroxide. As with antioxidant metabolites, the contributions of these enzymes to antioxidant defenses can be hard to separate from one another, but the generation of transgenic mice lacking just one antioxidant enzyme can be informative. Superoxide dismutases (SODs) are a class of closely related enzymes that catalyze the breakdown of the superoxide anion into oxygen and hydrogen peroxide. SOD enzymes are present in almost all aerobic cells and in extracellular fluids. Superoxide dismutase enzymes contain metal ion cofactors that, depending on the isozyme, can be copper, zinc, manganese or iron. In humans, the copper/zinc SOD is present in the cytosol, while manganese SOD is present in the mitochondrion. There also exists a third form of SOD in extracellular fluids, which contains copper and zinc in its active sites. The mitochondrial isozyme seems to be the most biologically important of these three, since mice lacking this enzyme die soon after birth. In contrast, the mice lacking copper/zinc SOD (Sod1) are viable but have numerous pathologies and a reduced lifespan (see article on superoxide), while mice without the extracellular SOD have minimal defects (sensitive to hyperoxia). In plants, SOD isozymes are present in the cytosol and mitochondria, with an iron SOD found in chloroplasts that is absent from vertebrates and yeast. Catalases are enzymes that catalyse the conversion of hydrogen peroxide to water and oxygen, using either an iron or manganese cofactor. This protein is localized to peroxisomes in most eukaryotic cells. Catalase is an unusual enzyme since, although hydrogen peroxide is its only substrate, it follows a ping-pong mechanism. Here, its cofactor is oxidised by one molecule of hydrogen peroxide and then regenerated by transferring the bound oxygen to a second molecule of substrate. Despite its apparent importance in hydrogen peroxide removal, humans with genetic deficiency of catalase — "acatalasemia" — or mice genetically engineered to lack catalase completely, suffer few ill effects. Decameric structure of AhpC, a bacterial 2-cysteine peroxiredoxin from Salmonella typhimurium. Peroxiredoxins are peroxidases that catalyze the reduction of hydrogen peroxide, organic hydroperoxides, as well as peroxynitrite. They are divided into three classes: typical 2-cysteine peroxiredoxins; atypical 2-cysteine peroxiredoxins; and 1-cysteine peroxiredoxins. These enzymes share the same basic catalytic mechanism, in which a redox-active cysteine (the peroxidatic cysteine) in the active site is oxidized to a sulfenic acid by the peroxide substrate. Over-oxidation of this cysteine residue in peroxiredoxins inactivates these enzymes, but this can be reversed by the action of sulfiredoxin. Peroxiredoxins seem to be important in antioxidant metabolism, as mice lacking peroxiredoxin 1 or 2 have shortened lifespan and suffer from hemolytic anaemia, while plants use peroxiredoxins to remove hydrogen peroxide generated in chloroplasts. The thioredoxin system contains the 12-kDa protein thioredoxin and its companion thioredoxin reductase. Proteins related to thioredoxin are present in all sequenced organisms. Plants, such as Arabidopsis thaliana, have a particularly great diversity of isoforms. The active site of thioredoxin consists of two neighboring cysteines, as part of a highly conserved CXXC motif, that can cycle between an active dithiol form (reduced) and an oxidized disulfide form. In its active state, thioredoxin acts as an efficient reducing agent, scavenging reactive oxygen species and maintaining other proteins in their reduced state. After being oxidized, the active thioredoxin is regenerated by the action of thioredoxin reductase, using NADPH as an electron donor. The glutathione system includes glutathione, glutathione reductase, glutathione peroxidases, and glutathione S-transferases. This system is found in animals, plants and microorganisms. Glutathione peroxidase is an enzyme containing four selenium-cofactors that catalyzes the breakdown of hydrogen peroxide and organic hydroperoxides. There are at least four different glutathione peroxidase isozymes in animals. Glutathione peroxidase 1 is the most abundant and is a very efficient scavenger of hydrogen peroxide, while glutathione peroxidase 4 is most active with lipid hydroperoxides. Surprisingly, glutathione peroxidase 1 is dispensable, as mice lacking this enzyme have normal lifespans, but they are hypersensitive to induced oxidative stress. In addition, the glutathione S-transferases show high activity with lipid peroxides. These enzymes are at particularly high levels in the liver and also serve in detoxification metabolism. Oxidative stress is thought to contribute to the development of a wide range of diseases including Alzheimer's disease, Parkinson's disease, the pathologies caused by diabetes, rheumatoid arthritis, and neurodegeneration in motor neuron diseases. In many of these cases, it is unclear if oxidants trigger the disease, or if they are produced as a secondary consequence of the disease and from general tissue damage; One case in which this link is particularly well understood is the role of oxidative stress in cardiovascular disease. Here, low density lipoprotein (LDL) oxidation appears to trigger the process of atherogenesis, which results in atherosclerosis, and finally cardiovascular disease. Oxidative damage in DNA can cause cancer. Several antioxidant enzymes such as superoxide dismutase, catalase, glutathione peroxidase, glutathione reductase, glutathione S-transferase etc. protect DNA from oxidative stress. It has been proposed that polymorphisms in these enzymes are associated with DNA damage and subsequently the individual's risk of cancer susceptibility. A low calorie diet extends median and maximum lifespan in many animals. This effect may involve a reduction in oxidative stress. While there is some evidence to support the role of oxidative stress in aging in model organisms such as Drosophila melanogaster and Caenorhabditis elegans, the evidence in mammals is less clear. Indeed, a 2009 review of experiments in mice concluded that almost all manipulations of antioxidant systems had no effect on aging. Antioxidants are used as food additives to help guard against food deterioration. Exposure to oxygen and sunlight are the two main factors in the oxidation of food, so food is preserved by keeping in the dark and sealing it in containers or even coating it in wax, as with cucumbers. However, as oxygen is also important for plant respiration, storing plant materials in anaerobic conditions produces unpleasant flavors and unappealing colors. Consequently, packaging of fresh fruits and vegetables contains an ~8% oxygen atmosphere. Antioxidants are an especially important class of preservatives as, unlike bacterial or fungal spoilage, oxidation reactions still occur relatively rapidly in frozen or refrigerated food. These preservatives include natural antioxidants such as ascorbic acid (AA, E300) and tocopherols (E306), as well as synthetic antioxidants such as propyl gallate (PG, E310), tertiary butylhydroquinone (TBHQ), butylated hydroxyanisole (BHA, E320) and butylated hydroxytoluene (BHT, E321). The most common molecules attacked by oxidation are unsaturated fats; oxidation causes them to turn rancid. Since oxidized lipids are often discolored and usually have unpleasant tastes such as metallic or sulfurous flavors, it is important to avoid oxidation in fat-rich foods. Thus, these foods are rarely preserved by drying; instead, they are preserved by smoking, salting or fermenting. Even less fatty foods such as fruits are sprayed with sulfurous antioxidants prior to air drying. Oxidation is often catalyzed by metals, which is why fats such as butter should never be wrapped in aluminium foil or kept in metal containers. Some fatty foods such as olive oil are partially protected from oxidation by their natural content of antioxidants, but remain sensitive to photooxidation. Antioxidant preservatives are also added to fat based cosmetics such as lipstick and moisturizers to prevent rancidity. Substituted phenols and derivatives of phenylenediamine are common antioxidants used to inhibit gum formation in gasoline (petrol). Antioxidants are frequently added to industrial products. A common use is as stabilizers in fuels and lubricants to prevent oxidation, and in gasolines to prevent the polymerization that leads to the formation of engine-fouling residues. In 2014, the worldwide market for natural and synthetic antioxidants was US$2.25 billion with a forecast of growth to $3.25 billion by 2020. Antioxidant polymer stabilizers are widely used to prevent the degradation of polymers such as rubbers, plastics and adhesives that causes a loss of strength and flexibility in these materials. Polymers containing double bonds in their main chains, such as natural rubber and polybutadiene, are especially susceptible to oxidation and ozonolysis. They can be protected by antiozonants. Solid polymer products start to crack on exposed surfaces as the material degrades and the chains break. The mode of cracking varies between oxygen and ozone attack, the former causing a "crazy paving" effect, while ozone attack produces deeper cracks aligned at right angles to the tensile strain in the product. Oxidation and UV degradation are also frequently linked, mainly because UV radiation creates free radicals by bond breakage. The free radicals then react with oxygen to produce peroxy radicals which cause yet further damage, often in a chain reaction. Other polymers susceptible to oxidation include polypropylene and polyethylene. The former is more sensitive owing to the presence of secondary carbon atoms present in every repeat unit. Attack occurs at this point because the free radical formed is more stable than one formed on a primary carbon atom. Oxidation of polyethylene tends to occur at weak links in the chain, such as branch points in low-density polyethylene. Antioxidant vitamins are found in vegetables, fruits, eggs, legumes and nuts. Vitamins A, C, and E can be destroyed by long-term storage or prolonged cooking. The effects of cooking and food processing are complex, as these processes can also increase the bioavailability of antioxidants, such as some carotenoids in vegetables. Processed food contains fewer antioxidant vitamins than fresh and uncooked foods, as preparation exposes food to heat and oxygen. Other antioxidants are not obtained from the diet, but instead are made in the body. For example, ubiquinol (coenzyme Q) is poorly absorbed from the gut and is made through the mevalonate pathway. Another example is glutathione, which is made from amino acids. As any glutathione in the gut is broken down to free cysteine, glycine and glutamic acid before being absorbed, even large oral intake has little effect on the concentration of glutathione in the body. Although large amounts of sulfur-containing amino acids such as acetylcysteine can increase glutathione, no evidence exists that eating high levels of these glutathione precursors is beneficial for healthy adults. Measurement of antioxidant content in food is not a straightforward process, as antioxidants collectively are a diverse group of compounds with different reactivities to various reactive oxygen species. In food science, the oxygen radical absorbance capacity (ORAC) was once an industry standard for estimating antioxidant strength of whole foods, juices and food additives, mainly from the presence of polyphenols. Earlier measurements and ratings by the United States Department of Agriculture were withdrawn in 2012 as biologically irrelevant to human health, referring to an absence of physiological evidence for polyphenols having antioxidant properties in vivo. Consequently, the ORAC method, derived only from in vitro experiments, is no longer considered relevant to human diets or biology. Alternative in vitro measurements of antioxidant content in foods – also based on the presence of polyphenols – include the Folin-Ciocalteu reagent, and the Trolox equivalent antioxidant capacity assay. As part of their adaptation from marine life, terrestrial plants began producing non-marine antioxidants such as ascorbic acid (vitamin C), polyphenols and tocopherols. The evolution of angiosperm plants between 50 and 200 million years ago resulted in the development of many antioxidant pigments – particularly during the Jurassic period – as chemical defences against reactive oxygen species that are byproducts of photosynthesis. Originally, the term antioxidant specifically referred to a chemical that prevented the consumption of oxygen. In the late 19th and early 20th centuries, extensive study concentrated on the use of antioxidants in important industrial processes, such as the prevention of metal corrosion, the vulcanization of rubber, and the polymerization of fuels in the fouling of internal combustion engines. Early research on the role of antioxidants in biology focused on their use in preventing the oxidation of unsaturated fats, which is the cause of rancidity. Antioxidant activity could be measured simply by placing the fat in a closed container with oxygen and measuring the rate of oxygen consumption. However, it was the identification of vitamins C and E as antioxidants that revolutionized the field and led to the realization of the importance of antioxidants in the biochemistry of living organisms. The possible mechanisms of action of antioxidants were first explored when it was recognized that a substance with anti-oxidative activity is likely to be one that is itself readily oxidized. Research into how vitamin E prevents the process of lipid peroxidation led to the identification of antioxidants as reducing agents that prevent oxidative reactions, often by scavenging reactive oxygen species before they can damage cells. ^ Dabelstein W, Reglitzky A, Schütze A, Reders K (2007). "Automotive Fuels". Ullmann's Encyclopedia of Industrial Chemistry. doi:10.1002/14356007.a16_719.pub2. ISBN 978-3-527-30673-2. ^ "Antioxidants: In Depth". NCCIH. Retrieved 20 June 2018. ^ Bjelakovic G, Nikolova D, Gluud C (2013). "Meta-regression analyses, meta-analyses, and trial sequential analyses of the effects of supplementation with beta-carotene, vitamin A, and vitamin E singly or in different combinations on all-cause mortality: do we have evidence for lack of harm?". PLoS ONE. 8 (9): e74558. Bibcode:2013PLoSO...874558B. doi:10.1371/journal.pone.0074558. PMC 3765487. PMID 24040282. ^ Abner EL, Schmitt FA, Mendiondo MS, Marcum JL, Kryscio RJ (July 2011). "Vitamin E and all-cause mortality: a meta-analysis". Current Aging Science. 4 (2): 158–70. doi:10.2174/1874609811104020158. PMC 4030744. PMID 21235492. ^ Cortés-Jofré M, Rueda JR, Corsini-Muñoz G, Fonseca-Cortés C, Caraballoso M, Bonfill Cosp X (2012). "Drugs for preventing lung cancer in healthy people". The Cochrane Database of Systematic Reviews. 10: CD002141. doi:10.1002/14651858.CD002141.pub2. PMID 23076895. ^ Jiang L, Yang KH, Tian JH, Guan QL, Yao N, Cao N, Mi DH, Wu J, Ma B, Yang SH (2010). "Efficacy of antioxidant vitamins and selenium supplement in prostate cancer prevention: a meta-analysis of randomized controlled trials". Nutrition and Cancer. 62 (6): 719–27. doi:10.1080/01635581.2010.494335. PMID 20661819. ^ Rees K, Hartley L, Day C, Flowers N, Clarke A, Stranges S (2013). "Selenium supplementation for the primary prevention of cardiovascular disease" (PDF). The Cochrane Database of Systematic Reviews. 1 (1): CD009671. doi:10.1002/14651858.CD009671.pub2. PMC 4176632. PMID 23440843. ^ Shekelle PG, Morton SC, Jungvig LK, Udani J, Spar M, Tu W, J Suttorp M, Coulter I, Newberry SJ, Hardy M (April 2004). "Effect of supplemental vitamin E for the prevention and treatment of cardiovascular disease". Journal of General Internal Medicine. 19 (4): 380–9. doi:10.1111/j.1525-1497.2004.30090.x. PMC 1492195. PMID 15061748. ^ a b c Stanner SA, Hughes J, Kelly CN, Buttriss J (May 2004). "A review of the epidemiological evidence for the 'antioxidant hypothesis'". Public Health Nutrition. 7 (3): 407–22. doi:10.1079/PHN2003543. PMID 15153272. ^ a b Shenkin A (February 2006). "The key role of micronutrients". Clinical Nutrition. 25 (1): 1–13. doi:10.1016/j.clnu.2005.11.006. PMID 16376462. ^ Woodside JV, McCall D, McGartland C, Young IS (November 2005). "Micronutrients: dietary intake v. supplement use". The Proceedings of the Nutrition Society. 64 (4): 543–53. doi:10.1079/PNS2005464. PMID 16313697. ^ Food, Nutrition, Physical Activity, and the Prevention of Cancer: a Global Perspective. World Cancer Research Fund (2007). ISBN 978-0-9722522-2-5. ^ Hail N, Cortes M, Drake EN, Spallholz JE (July 2008). "Cancer chemoprevention: a radical perspective". Free Radical Biology & Medicine. 45 (2): 97–110. doi:10.1016/j.freeradbiomed.2008.04.004. PMID 18454943. ^ "Flavonoids". Linus Pauling Institute, Oregon State University, Corvallis. 2016. Retrieved 24 July 2016. ^ Crichton GE, Bryan J, Murphy KJ (September 2013). "Dietary antioxidants, cognitive function and dementia--a systematic review". Plant Foods for Human Nutrition. 68 (3): 279–92. doi:10.1007/s11130-013-0370-0. PMID 23881465. ^ Takeda A, Nyssen OP, Syed A, Jansen E, Bueno-de-Mesquita B, Gallo V (2014). "Vitamin A and carotenoids and the risk of Parkinson's disease: a systematic review and meta-analysis". Neuroepidemiology. 42 (1): 25–38. doi:10.1159/000355849. PMID 24356061. ^ Harrison FE (2012). "A critical review of vitamin C for the prevention of age-related cognitive decline and Alzheimer's disease". Journal of Alzheimer's Disease. 29 (4): 711–26. doi:10.3233/JAD-2012-111853. PMC 3727637. PMID 22366772. ^ Lemmo W (September 2014). "Potential interactions of prescription and over-the-counter medications having antioxidant capabilities with radiation and chemotherapy". International Journal of Cancer. 137 (11): 2525–33. doi:10.1002/ijc.29208. PMID 25220632. ^ Magalhães P, Dean O, Andreazza A (2016). "Antioxidant treatments for schizophrenia". Cochrane Database of Systematic Reviews. 1: CD008919.pub2. doi:10.1002/14651858.CD008919.pub2. PMID 26848926. ^ Zhang S, Wang L, Liu M, Wu B (2010). "Tirilazad for aneurysmal subarachnoid haemorrhage". The Cochrane Database of Systematic Reviews (2): CD006778. doi:10.1002/14651858.CD006778.pub2. PMID 20166088. ^ Bath PM, Iddenden R, Bath FJ, Orgogozo JM (2001). "Tirilazad for acute ischaemic stroke". The Cochrane Database of Systematic Reviews (4): CD002087. doi:10.1002/14651858.CD002087. PMID 11687138. ^ Hurrell RF (September 2003). "Influence of vegetable protein sources on trace element and mineral bioavailability". The Journal of Nutrition. 133 (9): 2973S–7S. doi:10.1093/jn/133.9.2973S. PMID 12949395. ^ Hunt JR (September 2003). "Bioavailability of iron, zinc, and other trace minerals from vegetarian diets". The American Journal of Clinical Nutrition. 78 (3 Suppl): 633S–639S. doi:10.1093/ajcn/78.3.633S. PMID 12936958. ^ Gibson RS, Perlas L, Hotz C (May 2006). "Improving the bioavailability of nutrients in plant foods at the household level". The Proceedings of the Nutrition Society. 65 (2): 160–8. doi:10.1079/PNS2006489. PMID 16672077. ^ a b Mosha TC, Gaga HE, Pace RD, Laswai HS, Mtebe K (June 1995). "Effect of blanching on the content of antinutritional factors in selected vegetables". Plant Foods for Human Nutrition. 47 (4): 361–7. doi:10.1007/BF01088275. PMID 8577655. ^ Sandberg AS (December 2002). "Bioavailability of minerals in legumes". The British Journal of Nutrition. 88 Suppl 3 (Suppl 3): S281–5. doi:10.1079/BJN/2002718. PMID 12498628. ^ a b Beecher GR (October 2003). "Overview of dietary flavonoids: nomenclature, occurrence and intake". The Journal of Nutrition. 133 (10): 3248S–3254S. doi:10.1093/jn/133.10.3248S. PMID 14519822. ^ Omenn GS, Goodman GE, Thornquist MD, Balmes J, Cullen MR, Glass A, Keogh JP, Meyskens FL, Valanis B, Williams JH, Barnhart S, Cherniack MG, Brodkin CA, Hammar S (November 1996). "Risk factors for lung cancer and for intervention effects in CARET, the Beta-Carotene and Retinol Efficacy Trial" (PDF). Journal of the National Cancer Institute. 88 (21): 1550–9. doi:10.1093/jnci/88.21.1550. PMID 8901853. ^ Albanes D (June 1999). "Beta-carotene and lung cancer: a case study". The American Journal of Clinical Nutrition. 69 (6): 1345S–50S. doi:10.1093/ajcn/69.6.1345S. PMID 10359235. ^ a b Bjelakovic G, Nikolova D, Gluud LL, Simonetti RG, Gluud C (February 2007). "Mortality in randomized trials of antioxidant supplements for primary and secondary prevention: systematic review and meta-analysis". JAMA. 297 (8): 842–57. doi:10.1001/jama.297.8.842. PMID 17327526. ^ a b Bjelakovic G, Nikolova D, Gluud LL, Simonetti RG, Gluud C (14 March 2012). "Antioxidant supplements for prevention of mortality in healthy participants and patients with various diseases" (PDF). The Cochrane Database of Systematic Reviews (Submitted manuscript). 3 (3): CD007176. doi:10.1002/14651858.CD007176.pub2. PMID 22419320. ^ Miller ER, Pastor-Barriuso R, Dalal D, Riemersma RA, Appel LJ, Guallar E (January 2005). "Meta-analysis: high-dosage vitamin E supplementation may increase all-cause mortality". Annals of Internal Medicine. 142 (1): 37–46. doi:10.7326/0003-4819-142-1-200501040-00110. PMID 15537682. ^ a b Bjelakovic G, Nagorni A, Nikolova D, Simonetti RG, Bjelakovic M, Gluud C (July 2006). "Meta-analysis: antioxidant supplements for primary and secondary prevention of colorectal adenoma". Alimentary Pharmacology & Therapeutics. 24 (2): 281–91. doi:10.1111/j.1365-2036.2006.02970.x. PMID 16842454. ^ Cortés-Jofré M, Rueda JR, Corsini-Muñoz G, Fonseca-Cortés C, Caraballoso M, Bonfill Cosp X (17 October 2012). "Drugs for preventing lung cancer in healthy people". The Cochrane Database of Systematic Reviews. 10: CD002141. doi:10.1002/14651858.CD002141.pub2. PMID 23076895. ^ a b c Davies KJ (1995). "Oxidative stress: the paradox of aerobic life". Biochemical Society Symposium. 61: 1–31. doi:10.1042/bss0610001. PMID 8660387. ^ a b c d e Sies H (March 1997). "Oxidative stress: oxidants and antioxidants". Experimental Physiology. 82 (2): 291–5. doi:10.1113/expphysiol.1997.sp004024. PMID 9129943. ^ a b c d Vertuani S, Angusti A, Manfredini S (2004). "The antioxidants and pro-antioxidants network: an overview". Current Pharmaceutical Design. 10 (14): 1677–94. doi:10.2174/1381612043384655. PMID 15134565. ^ Rhee SG (June 2006). "Cell signaling. H2O2, a necessary evil for cell signaling". Science. 312 (5782): 1882–3. doi:10.1126/science.1130481. PMID 16809515. ^ a b Valko M, Leibfritz D, Moncol J, Cronin MT, Mazur M, Telser J (2007). "Free radicals and antioxidants in normal physiological functions and human disease". The International Journal of Biochemistry & Cell Biology. 39 (1): 44–84. doi:10.1016/j.biocel.2006.07.001. PMID 16978905. ^ a b Stohs SJ, Bagchi D (February 1995). "Oxidative mechanisms in the toxicity of metal ions" (PDF). Free Radical Biology & Medicine (Submitted manuscript). 18 (2): 321–36. CiteSeerX 10.1.1.461.6417. doi:10.1016/0891-5849(94)00159-H. PMID 7744317. ^ Nakabeppu Y, Sakumi K, Sakamoto K, Tsuchimoto D, Tsuzuki T, Nakatsu Y (April 2006). "Mutagenesis and carcinogenesis caused by the oxidation of nucleic acids". Biological Chemistry. 387 (4): 373–9. doi:10.1515/BC.2006.050. PMID 16606334. ^ Valko M, Izakovic M, Mazur M, Rhodes CJ, Telser J (November 2004). "Role of oxygen radicals in DNA damage and cancer incidence". Molecular and Cellular Biochemistry. 266 (1–2): 37–56. doi:10.1023/B:MCBI.0000049134.69131.89. PMID 15646026. ^ Stadtman ER (August 1992). "Protein oxidation and aging". Science. 257 (5074): 1220–4. Bibcode:1992Sci...257.1220S. doi:10.1126/science.1355616. PMID 1355616. ^ Raha S, Robinson BH (October 2000). "Mitochondria, oxygen free radicals, disease and ageing". Trends in Biochemical Sciences. 25 (10): 502–8. doi:10.1016/S0968-0004(00)01674-1. PMID 11050436. ^ Lenaz G (2001). "The mitochondrial production of reactive oxygen species: mechanisms and implications in human pathology". IUBMB Life. 52 (3–5): 159–64. doi:10.1080/15216540152845957. PMID 11798028. ^ Finkel T, Holbrook NJ (November 2000). "Oxidants, oxidative stress and the biology of ageing". Nature. 408 (6809): 239–47. Bibcode:2000Natur.408..239F. doi:10.1038/35041687. PMID 11089981. ^ Hirst J, King MS, Pryde KR (October 2008). "The production of reactive oxygen species by complex I". Biochemical Society Transactions. 36 (Pt 5): 976–80. doi:10.1042/BST0360976. PMID 18793173. ^ Seaver LC, Imlay JA (November 2004). "Are respiratory enzymes the primary sources of intracellular hydrogen peroxide?". The Journal of Biological Chemistry. 279 (47): 48742–50. doi:10.1074/jbc.M408754200. PMID 15361522. ^ a b Imlay JA (2003). "Pathways of oxidative damage". Annual Review of Microbiology. 57: 395–418. doi:10.1146/annurev.micro.57.030502.090938. PMID 14527285. ^ Demmig-Adams B, Adams WW (December 2002). "Antioxidants in photosynthesis and human nutrition". Science. 298 (5601): 2149–53. Bibcode:2002Sci...298.2149D. doi:10.1126/science.1078002. PMID 12481128. ^ Krieger-Liszkay A (January 2005). "Singlet oxygen production in photosynthesis". Journal of Experimental Botany. 56 (411): 337–46. CiteSeerX 10.1.1.327.9651. doi:10.1093/jxb/erh237. PMID 15310815. ^ Kupper FC, Carpenter LJ, McFiggans GB, Palmer CJ, Waite TJ, Boneberg E-M, Woitsch S, Weiller M, Abela R, Grolimund D, Potin P, Butler A, Luther GW, Kroneck PMH, Meyer-Klaucke W, Feiters MC (2008). "Iodide accumulation provides kelp with an inorganic antioxidant impacting atmospheric chemistry". Proceedings of the National Academy of Sciences. 105 (19): 6954–6958. Bibcode:2008PNAS..105.6954K. doi:10.1073/pnas.0709959105. ISSN 0027-8424. PMC 2383960. PMID 18458346. ^ Szabó I, Bergantino E, Giacometti GM (July 2005). "Light and oxygenic photosynthesis: energy dissipation as a protection mechanism against photo-oxidation". EMBO Reports. 6 (7): 629–34. doi:10.1038/sj.embor.7400460. PMC 1369118. PMID 15995679. ^ Kerfeld CA (October 2004). "Water-soluble carotenoid proteins of cyanobacteria" (PDF). Archives of Biochemistry and Biophysics (Submitted manuscript). 430 (1): 2–9. doi:10.1016/j.abb.2004.03.018. PMID 15325905. ^ Miller RA, Britigan BE (January 1997). "Role of oxidants in microbial pathophysiology". Clinical Microbiology Reviews. 10 (1): 1–18. PMC 172912. PMID 8993856. ^ Chaudière J, Ferrari-Iliou R (1999). "Intracellular antioxidants: from chemical to biochemical mechanisms". Food and Chemical Toxicology. 37 (9–10): 949–62. doi:10.1016/S0278-6915(99)00090-3. PMID 10541450. ^ Sies H (July 1993). "Strategies of antioxidant defense". European Journal of Biochemistry / FEBS. 215 (2): 213–9. doi:10.1111/j.1432-1033.1993.tb18025.x. PMID 7688300. ^ Khaw KT, Woodhouse P (June 1995). "Interrelation of vitamin C, infection, haemostatic factors, and cardiovascular disease". BMJ. 310 (6994): 1559–63. doi:10.1136/bmj.310.6994.1559. PMC 2549940. PMID 7787643. ^ a b c d Evelson P, Travacio M, Repetto M, Escobar J, Llesuy S, Lissi EA (April 2001). "Evaluation of total reactive antioxidant potential (TRAP) of tissue homogenates and their cytosols". Archives of Biochemistry and Biophysics. 388 (2): 261–6. doi:10.1006/abbi.2001.2292. PMID 11368163. ^ Morrison JA, Jacobsen DW, Sprecher DL, Robinson K, Khoury P, Daniels SR (November 1999). "Serum glutathione in adolescent males predicts parental coronary heart disease" (PDF). Circulation. 100 (22): 2244–7. doi:10.1161/01.CIR.100.22.2244. PMID 10577998. ^ Teichert J, Preiss R (November 1992). "HPLC-methods for determination of lipoic acid and its reduced form in human plasma". International Journal of Clinical Pharmacology, Therapy, and Toxicology. 30 (11): 511–2. PMID 1490813. ^ Akiba S, Matsugo S, Packer L, Konishi T (May 1998). "Assay of protein-bound lipoic acid in tissues by a new enzymatic method". Analytical Biochemistry. 258 (2): 299–304. doi:10.1006/abio.1998.2615. PMID 9570844. ^ a b Glantzounis GK, Tsimoyiannis EC, Kappas AM, Galaris DA (2005). "Uric acid and oxidative stress". Current Pharmaceutical Design. 11 (32): 4145–51. doi:10.2174/138161205774913255. PMID 16375736. ^ El-Sohemy A, Baylin A, Kabagambe E, Ascherio A, Spiegelman D, Campos H (July 2002). "Individual carotenoid concentrations in adipose tissue and plasma as biomarkers of dietary intake". The American Journal of Clinical Nutrition. 76 (1): 172–9. doi:10.1093/ajcn/76.1.172. PMID 12081831. ^ a b Sowell AL, Huff DL, Yeager PR, Caudill SP, Gunter EW (March 1994). "Retinol, alpha-tocopherol, lutein/zeaxanthin, beta-cryptoxanthin, lycopene, alpha-carotene, trans-beta-carotene, and four retinyl esters in serum determined simultaneously by reversed-phase HPLC with multiwavelength detection". Clinical Chemistry. 40 (3): 411–6. PMID 8131277. ^ Stahl W, Schwarz W, Sundquist AR, Sies H (April 1992). "cis-trans isomers of lycopene and beta-carotene in human serum and tissues". Archives of Biochemistry and Biophysics. 294 (1): 173–7. doi:10.1016/0003-9861(92)90153-N. PMID 1550343. ^ Zita C, Overvad K, Mortensen SA, Sindberg CD, Moesgaard S, Hunter DA (2003). "Serum coenzyme Q10 concentrations in healthy men supplemented with 30 mg or 100 mg coenzyme Q10 for two months in a randomised controlled study". BioFactors. 18 (1–4): 185–93. doi:10.1002/biof.5520180221. PMID 14695934. ^ a b Turunen M, Olsson J, Dallner G (January 2004). "Metabolism and function of coenzyme Q". Biochimica et Biophysica Acta. 1660 (1–2): 171–99. doi:10.1016/j.bbamem.2003.11.012. PMID 14757233. ^ a b Enomoto A, Endou H (September 2005). "Roles of organic anion transporters (OATs) and a urate transporter (URAT1) in the pathophysiology of human disease". Clinical and Experimental Nephrology. 9 (3): 195–205. doi:10.1007/s10157-005-0368-5. PMID 16189627. ^ a b Wu XW, Lee CC, Muzny DM, Caskey CT (December 1989). "Urate oxidase: primary structure and evolutionary implications". Proceedings of the National Academy of Sciences of the United States of America. 86 (23): 9412–6. Bibcode:1989PNAS...86.9412W. doi:10.1073/pnas.86.23.9412. PMC 298506. PMID 2594778. ^ Wu XW, Muzny DM, Lee CC, Caskey CT (January 1992). "Two independent mutational events in the loss of urate oxidase during hominoid evolution". Journal of Molecular Evolution. 34 (1): 78–84. Bibcode:1992JMolE..34...78W. doi:10.1007/BF00163854. PMID 1556746. ^ Álvarez-Lario B, Macarrón-Vicente J (November 2010). "Uric acid and evolution". Rheumatology. 49 (11): 2010–5. doi:10.1093/rheumatology/keq204. PMID 20627967. ^ a b Watanabe S, Kang DH, Feng L, Nakagawa T, Kanellis J, Lan H, Mazzali M, Johnson RJ (September 2002). "Uric acid, hominoid evolution, and the pathogenesis of salt-sensitivity". Hypertension. 40 (3): 355–60. doi:10.1161/01.HYP.0000028589.66335.AA. PMID 12215479. ^ Johnson RJ, Andrews P, Benner SA, Oliver W (2010). "Theodore E. Woodward award. The evolution of obesity: insights from the mid-Miocene". Transactions of the American Clinical and Climatological Association. 121: 295–305, discussion 305–8. PMC 2917125. PMID 20697570. ^ a b Baillie JK, Bates MG, Thompson AA, Waring WS, Partridge RW, Schnopp MF, Simpson A, Gulliver-Sloan F, Maxwell SR, Webb DJ (May 2007). "Endogenous urate production augments plasma antioxidant capacity in healthy lowland subjects exposed to high altitude". Chest. 131 (5): 1473–8. doi:10.1378/chest.06-2235. PMID 17494796. ^ Becker BF (June 1993). "Towards the physiological function of uric acid". Free Radical Biology & Medicine. 14 (6): 615–31. doi:10.1016/0891-5849(93)90143-I. PMID 8325534. ^ a b Sautin YY, Johnson RJ (June 2008). "Uric acid: the oxidant-antioxidant paradox". Nucleosides, Nucleotides & Nucleic Acids. 27 (6): 608–19. doi:10.1080/15257770802138558. PMC 2895915. PMID 18600514. ^ Eggebeen AT (September 2007). "Gout: an update". American Family Physician. 76 (6): 801–8. PMID 17910294. ^ Campion EW, Glynn RJ, DeLabry LO (March 1987). "Asymptomatic hyperuricemia. Risks and consequences in the Normative Aging Study". The American Journal of Medicine. 82 (3): 421–6. doi:10.1016/0002-9343(87)90441-4. PMID 3826098. ^ Nazarewicz RR, Ziolkowski W, Vaccaro PS, Ghafourifar P (December 2007). "Effect of short-term ketogenic diet on redox status of human blood". Rejuvenation Research. 10 (4): 435–40. doi:10.1089/rej.2007.0540. PMID 17663642. ^ Smirnoff N (2001). L-ascorbic acid biosynthesis. Vitamins and Hormones. Vitamins & Hormones. 61. pp. 241–66. doi:10.1016/S0083-6729(01)61008-2. ISBN 978-0-12-709861-6. PMID 11153268. ^ Linster CL, Van Schaftingen E (January 2007). "Vitamin C. Biosynthesis, recycling and degradation in mammals". The FEBS Journal. 274 (1): 1–22. doi:10.1111/j.1742-4658.2006.05607.x. PMID 17222174. ^ a b Meister A (April 1994). "Glutathione-ascorbic acid antioxidant system in animals". The Journal of Biological Chemistry. 269 (13): 9397–400. PMID 8144521. ^ Wells WW, Xu DP, Yang YF, Rocque PA (September 1990). "Mammalian thioltransferase (glutaredoxin) and protein disulfide isomerase have dehydroascorbate reductase activity". The Journal of Biological Chemistry. 265 (26): 15361–4. PMID 2394726. ^ Padayatty SJ, Katz A, Wang Y, Eck P, Kwon O, Lee JH, Chen S, Corpe C, Dutta A, Dutta SK, Levine M (February 2003). "Vitamin C as an antioxidant: evaluation of its role in disease prevention". Journal of the American College of Nutrition. 22 (1): 18–35. doi:10.1080/07315724.2003.10719272. PMID 12569111. ^ Shigeoka S, Ishikawa T, Tamoi M, Miyagawa Y, Takeda T, Yabuta Y, Yoshimura K (May 2002). "Regulation and function of ascorbate peroxidase isoenzymes". Journal of Experimental Botany. 53 (372): 1305–19. doi:10.1093/jexbot/53.372.1305. PMID 11997377. ^ Smirnoff N, Wheeler GL (2000). "Ascorbic acid in plants: biosynthesis and function". Critical Reviews in Biochemistry and Molecular Biology. 35 (4): 291–314. doi:10.1080/10409230008984166. PMID 11005203. ^ a b c d Meister A, Anderson ME (1983). "Glutathione". Annual Review of Biochemistry. 52: 711–60. doi:10.1146/annurev.bi.52.070183.003431. PMID 6137189. ^ Meister A (November 1988). "Glutathione metabolism and its selective modification". The Journal of Biological Chemistry. 263 (33): 17205–8. PMID 3053703. ^ Gaballa A, Newton GL, Antelmann H, Parsonage D, Upton H, Rawat M, Claiborne A, Fahey RC, Helmann JD (April 2010). "Biosynthesis and functions of bacillithiol, a major low-molecular-weight thiol in Bacilli". Proceedings of the National Academy of Sciences of the United States of America. 107 (14): 6482–6. Bibcode:2010PNAS..107.6482G. doi:10.1073/pnas.1000928107. PMC 2851989. PMID 20308541. ^ Newton GL, Rawat M, La Clair JJ, Jothivasan VK, Budiarto T, Hamilton CJ, Claiborne A, Helmann JD, Fahey RC (September 2009). "Bacillithiol is an antioxidant thiol produced in Bacilli". Nature Chemical Biology. 5 (9): 625–627. doi:10.1038/nchembio.189. PMC 3510479. PMID 19578333. ^ Fahey RC (2001). "Novel thiols of prokaryotes". Annual Review of Microbiology. 55: 333–56. doi:10.1146/annurev.micro.55.1.333. PMID 11544359. ^ Fairlamb AH, Cerami A (1992). "Metabolism and functions of trypanothione in the Kinetoplastida". Annual Review of Microbiology. 46: 695–729. doi:10.1146/annurev.mi.46.100192.003403. PMID 1444271. ^ a b Herrera E, Barbas C (March 2001). "Vitamin E: action, metabolism and perspectives". Journal of Physiology and Biochemistry. 57 (2): 43–56. doi:10.1007/BF03179812. PMID 11579997. ^ Packer L, Weber SU, Rimbach G (February 2001). "Molecular aspects of alpha-tocotrienol antioxidant action and cell signalling". The Journal of Nutrition. 131 (2): 369S–73S. doi:10.1093/jn/131.2.369S. PMID 11160563. ^ a b Brigelius-Flohé R, Traber MG (July 1999). "Vitamin E: function and metabolism". FASEB Journal. 13 (10): 1145–55. CiteSeerX 10.1.1.337.5276. doi:10.1096/fasebj.13.10.1145. PMID 10385606. ^ Traber MG, Atkinson J (July 2007). "Vitamin E, antioxidant and nothing more". Free Radical Biology & Medicine. 43 (1): 4–15. doi:10.1016/j.freeradbiomed.2007.03.024. PMC 2040110. PMID 17561088. ^ Wang X, Quinn PJ (July 1999). "Vitamin E and its function in membranes". Progress in Lipid Research. 38 (4): 309–36. doi:10.1016/S0163-7827(99)00008-9. PMID 10793887. ^ Seiler A, Schneider M, Förster H, Roth S, Wirth EK, Culmsee C, Plesnila N, Kremmer E, Rådmark O, Wurst W, Bornkamm GW, Schweizer U, Conrad M (September 2008). "Glutathione peroxidase 4 senses and translates oxidative stress into 12/15-lipoxygenase dependent- and AIF-mediated cell death". Cell Metabolism. 8 (3): 237–48. doi:10.1016/j.cmet.2008.07.005. PMID 18762024. ^ Brigelius-Flohé R, Davies KJ (July 2007). "Is vitamin E an antioxidant, a regulator of signal transduction and gene expression, or a 'junk' food? Comments on the two accompanying papers: "Molecular mechanism of alpha-tocopherol action" by A. Azzi and "Vitamin E, antioxidant and nothing more" by M. Traber and J. Atkinson". Free Radical Biology & Medicine. 43 (1): 2–3. doi:10.1016/j.freeradbiomed.2007.05.016. PMID 17561087. ^ Atkinson J, Epand RF, Epand RM (March 2008). "Tocopherols and tocotrienols in membranes: a critical review". Free Radical Biology & Medicine. 44 (5): 739–64. doi:10.1016/j.freeradbiomed.2007.11.010. PMID 18160049. ^ Azzi A (July 2007). "Molecular mechanism of alpha-tocopherol action". Free Radical Biology & Medicine. 43 (1): 16–21. doi:10.1016/j.freeradbiomed.2007.03.013. PMID 17561089. ^ Zingg JM, Azzi A (May 2004). "Non-antioxidant activities of vitamin E". Current Medicinal Chemistry. 11 (9): 1113–33. doi:10.2174/0929867043365332. PMID 15134510. Archived from the original on 6 October 2011. ^ Sen CK, Khanna S, Roy S (March 2006). "Tocotrienols: Vitamin E beyond tocopherols". Life Sciences. 78 (18): 2088–98. doi:10.1016/j.lfs.2005.12.001. PMC 1790869. PMID 16458936. ^ Duarte TL, Lunec J (July 2005). "Review: When is an antioxidant not an antioxidant? A review of novel actions and reactions of vitamin C". Free Radical Research. 39 (7): 671–86. doi:10.1080/10715760500104025. PMID 16036346. ^ a b Carr A, Frei B (June 1999). "Does vitamin C act as a pro-oxidant under physiological conditions?". FASEB Journal. 13 (9): 1007–24. PMID 10336883. ^ Schneider C (January 2005). "Chemistry and biology of vitamin E". Molecular Nutrition & Food Research. 49 (1): 7–30. doi:10.1002/mnfr.200400049. PMID 15580660. ^ Halliwell B (August 2008). "Are polyphenols antioxidants or pro-oxidants? What do we learn from cell culture and in vivo studies?". Archives of Biochemistry and Biophysics. 476 (2): 107–112. doi:10.1016/j.abb.2008.01.028. PMID 18284912. ^ Ristow M, Zarse K (June 2010). "How increased oxidative stress promotes longevity and metabolic health: The concept of mitochondrial hormesis (mitohormesis)". Experimental Gerontology. 45 (6): 410–418. doi:10.1016/j.exger.2010.03.014. PMID 20350594. ^ a b Ho YS, Magnenat JL, Gargano M, Cao J (October 1998). "The nature of antioxidant defense mechanisms: a lesson from transgenic studies". Environmental Health Perspectives. 106 Suppl 5 (Suppl 5): 1219–28. doi:10.2307/3433989. JSTOR 3433989. PMC 1533365. PMID 9788901. ^ Zelko IN, Mariani TJ, Folz RJ (August 2002). "Superoxide dismutase multigene family: a comparison of the CuZn-SOD (SOD1), Mn-SOD (SOD2), and EC-SOD (SOD3) gene structures, evolution, and expression". Free Radical Biology & Medicine. 33 (3): 337–49. doi:10.1016/S0891-5849(02)00905-X. PMID 12126755. ^ a b Bannister JV, Bannister WH, Rotilio G (1987). "Aspects of the structure, function, and applications of superoxide dismutase". CRC Critical Reviews in Biochemistry. 22 (2): 111–80. doi:10.3109/10409238709083738. PMID 3315461. ^ Johnson F, Giulivi C (2005). "Superoxide dismutases and their impact upon human health". Molecular Aspects of Medicine. 26 (4–5): 340–52. doi:10.1016/j.mam.2005.07.006. PMID 16099495. ^ Nozik-Grayck E, Suliman HB, Piantadosi CA (December 2005). "Extracellular superoxide dismutase". The International Journal of Biochemistry & Cell Biology. 37 (12): 2466–71. doi:10.1016/j.biocel.2005.06.012. PMID 16087389. ^ Melov S, Schneider JA, Day BJ, Hinerfeld D, Coskun P, Mirra SS, Crapo JD, Wallace DC (February 1998). "A novel neurological phenotype in mice lacking mitochondrial manganese superoxide dismutase". Nature Genetics. 18 (2): 159–63. doi:10.1038/ng0298-159. PMID 9462746. ^ Reaume AG, Elliott JL, Hoffman EK, Kowall NW, Ferrante RJ, Siwek DF, Wilcox HM, Flood DG, Beal MF, Brown RH, Scott RW, Snider WD (May 1996). "Motor neurons in Cu/Zn superoxide dismutase-deficient mice develop normally but exhibit enhanced cell death after axonal injury". Nature Genetics. 13 (1): 43–7. doi:10.1038/ng0596-43. PMID 8673102. ^ Van Camp W, Inzé D, Van Montagu M (1997). "The regulation and function of tobacco superoxide dismutases". Free Radical Biology & Medicine. 23 (3): 515–20. doi:10.1016/S0891-5849(97)00112-3. PMID 9214590. ^ Chelikani P, Fita I, Loewen PC (January 2004). "Diversity of structures and properties among catalases" (PDF). Cellular and Molecular Life Sciences (Submitted manuscript). 61 (2): 192–208. doi:10.1007/s00018-003-3206-5. PMID 14745498. ^ Zámocký M, Koller F (1999). "Understanding the structure and function of catalases: clues from molecular evolution and in vitro mutagenesis". Progress in Biophysics and Molecular Biology. 72 (1): 19–66. doi:10.1016/S0079-6107(98)00058-3. PMID 10446501. ^ del Río LA, Sandalio LM, Palma JM, Bueno P, Corpas FJ (November 1992). "Metabolism of oxygen radicals in peroxisomes and cellular implications". Free Radical Biology & Medicine. 13 (5): 557–80. doi:10.1016/0891-5849(92)90150-F. PMID 1334030. ^ Hiner AN, Raven EL, Thorneley RN, García-Cánovas F, Rodríguez-López JN (July 2002). "Mechanisms of compound I formation in heme peroxidases". Journal of Inorganic Biochemistry. 91 (1): 27–34. doi:10.1016/S0162-0134(02)00390-2. PMID 12121759. ^ Mueller S, Riedel HD, Stremmel W (December 1997). "Direct evidence for catalase as the predominant H2O2 -removing enzyme in human erythrocytes". Blood. 90 (12): 4973–8. PMID 9389716. ^ Ogata M (February 1991). "Acatalasemia". Human Genetics. 86 (4): 331–40. doi:10.1007/BF00201829. PMID 1999334. ^ Rhee SG, Chae HZ, Kim K (June 2005). "Peroxiredoxins: a historical overview and speculative preview of novel mechanisms and emerging concepts in cell signaling". Free Radical Biology & Medicine. 38 (12): 1543–52. doi:10.1016/j.freeradbiomed.2005.02.026. PMID 15917183. ^ Wood ZA, Schröder E, Robin Harris J, Poole LB (January 2003). "Structure, mechanism and regulation of peroxiredoxins". Trends in Biochemical Sciences. 28 (1): 32–40. doi:10.1016/S0968-0004(02)00003-8. PMID 12517450. ^ Claiborne A, Yeh JI, Mallett TC, Luba J, Crane EJ, Charrier V, Parsonage D (November 1999). "Protein-sulfenic acids: diverse roles for an unlikely player in enzyme catalysis and redox regulation". Biochemistry. 38 (47): 15407–16. doi:10.1021/bi992025k. PMID 10569923. ^ Jönsson TJ, Lowther WT (2007). The peroxiredoxin repair proteins. Sub-Cellular Biochemistry. Subcellular Biochemistry. 44. pp. 115–41. doi:10.1007/978-1-4020-6051-9_6. ISBN 978-1-4020-6050-2. PMC 2391273. PMID 18084892. ^ Neumann CA, Krause DS, Carman CV, Das S, Dubey DP, Abraham JL, Bronson RT, Fujiwara Y, Orkin SH, Van Etten RA (July 2003). "Essential role for the peroxiredoxin Prdx1 in erythrocyte antioxidant defence and tumour suppression" (PDF). Nature. 424 (6948): 561–5. Bibcode:2003Natur.424..561N. doi:10.1038/nature01819. PMID 12891360. ^ Lee TH, Kim SU, Yu SL, Kim SH, Park DS, Moon HB, Dho SH, Kwon KS, Kwon HJ, Han YH, Jeong S, Kang SW, Shin HS, Lee KK, Rhee SG, Yu DY (June 2003). "Peroxiredoxin II is essential for sustaining life span of erythrocytes in mice". Blood. 101 (12): 5033–8. doi:10.1182/blood-2002-08-2548. PMID 12586629. ^ Dietz KJ, Jacob S, Oelze ML, Laxa M, Tognetti V, de Miranda SM, Baier M, Finkemeier I (2006). "The function of peroxiredoxins in plant organelle redox metabolism". Journal of Experimental Botany. 57 (8): 1697–709. doi:10.1093/jxb/erj160. PMID 16606633. ^ Nordberg J, Arnér ES (December 2001). "Reactive oxygen species, antioxidants, and the mammalian thioredoxin system". Free Radical Biology & Medicine. 31 (11): 1287–312. doi:10.1016/S0891-5849(01)00724-9. PMID 11728801. ^ Vieira Dos Santos C, Rey P (July 2006). "Plant thioredoxins are key actors in the oxidative stress response". Trends in Plant Science. 11 (7): 329–34. doi:10.1016/j.tplants.2006.05.005. PMID 16782394. ^ Arnér ES, Holmgren A (October 2000). "Physiological functions of thioredoxin and thioredoxin reductase". European Journal of Biochemistry / FEBS. 267 (20): 6102–9. doi:10.1046/j.1432-1327.2000.01701.x. PMID 11012661. ^ Mustacich D, Powis G (February 2000). "Thioredoxin reductase". The Biochemical Journal. 346 (1): 1–8. doi:10.1042/0264-6021:3460001. PMC 1220815. PMID 10657232. ^ Creissen G, Broadbent P, Stevens R, Wellburn AR, Mullineaux P (May 1996). "Manipulation of glutathione metabolism in transgenic plants". Biochemical Society Transactions. 24 (2): 465–9. doi:10.1042/bst0240465. PMID 8736785. ^ Brigelius-Flohé R (November 1999). "Tissue-specific functions of individual glutathione peroxidases". Free Radical Biology & Medicine. 27 (9–10): 951–65. doi:10.1016/S0891-5849(99)00173-2. PMID 10569628. ^ Ho YS, Magnenat JL, Bronson RT, Cao J, Gargano M, Sugawara M, Funk CD (June 1997). "Mice deficient in cellular glutathione peroxidase develop normally and show no increased sensitivity to hyperoxia". The Journal of Biological Chemistry. 272 (26): 16644–51. doi:10.1074/jbc.272.26.16644. PMID 9195979. ^ de Haan JB, Bladier C, Griffiths P, Kelner M, O'Shea RD, Cheung NS, Bronson RT, Silvestro MJ, Wild S, Zheng SS, Beart PM, Hertzog PJ, Kola I (August 1998). "Mice with a homozygous null mutation for the most abundant glutathione peroxidase, Gpx1, show increased susceptibility to the oxidative stress-inducing agents paraquat and hydrogen peroxide". The Journal of Biological Chemistry. 273 (35): 22528–36. doi:10.1074/jbc.273.35.22528. PMID 9712879. ^ Sharma R, Yang Y, Sharma A, Awasthi S, Awasthi YC (April 2004). "Antioxidant role of glutathione S-transferases: protection against oxidant toxicity and regulation of stress-mediated apoptosis". Antioxidants & Redox Signaling. 6 (2): 289–300. doi:10.1089/152308604322899350. PMID 15025930. ^ Hayes JD, Flanagan JU, Jowsey IR (2005). "Glutathione transferases". Annual Review of Pharmacology and Toxicology. 45: 51–88. doi:10.1146/annurev.pharmtox.45.120403.095857. PMID 15822171. ^ Christen Y (February 2000). "Oxidative stress and Alzheimer disease". The American Journal of Clinical Nutrition. 71 (2): 621S–629S. doi:10.1093/ajcn/71.2.621s. PMID 10681270. ^ Nunomura A, Castellani RJ, Zhu X, Moreira PI, Perry G, Smith MA (July 2006). "Involvement of oxidative stress in Alzheimer disease". Journal of Neuropathology and Experimental Neurology. 65 (7): 631–41. doi:10.1097/01.jnen.0000228136.58062.bf. PMID 16825950. ^ Wood-Kaczmar A, Gandhi S, Wood NW (November 2006). "Understanding the molecular causes of Parkinson's disease". Trends in Molecular Medicine. 12 (11): 521–8. doi:10.1016/j.molmed.2006.09.007. PMID 17027339. ^ Davì G, Falco A, Patrono C (2005). "Lipid peroxidation in diabetes mellitus". Antioxidants & Redox Signaling. 7 (1–2): 256–68. doi:10.1089/ars.2005.7.256. PMID 15650413. ^ Giugliano D, Ceriello A, Paolisso G (March 1996). "Oxidative stress and diabetic vascular complications". Diabetes Care. 19 (3): 257–67. doi:10.2337/diacare.19.3.257. PMID 8742574. ^ Hitchon CA, El-Gabalawy HS (2004). "Oxidation in rheumatoid arthritis". Arthritis Research & Therapy. 6 (6): 265–78. doi:10.1186/ar1447. PMC 1064874. PMID 15535839. ^ Cookson MR, Shaw PJ (January 1999). "Oxidative stress and motor neurone disease". Brain Pathology. 9 (1): 165–86. doi:10.1111/j.1750-3639.1999.tb00217.x. PMID 9989458. ^ Van Gaal LF, Mertens IL, De Block CE (December 2006). "Mechanisms linking obesity with cardiovascular disease". Nature. 444 (7121): 875–80. Bibcode:2006Natur.444..875V. doi:10.1038/nature05487. PMID 17167476. ^ Aviram M (November 2000). "Review of human studies on oxidative damage and antioxidant protection related to cardiovascular diseases". Free Radical Research. 33 Suppl: S85–97. PMID 11191279. ^ Khan MA, Tania M, Zhang D, Chen H (2010). "Antioxidant enzymes and cancer". Chin J Cancer Res. 22 (2): 87–92. doi:10.1007/s11670-010-0087-7. ^ López-Lluch G, Hunt N, Jones B, Zhu M, Jamieson H, Hilmer S, Cascajo MV, Allard J, Ingram DK, Navas P, de Cabo R (February 2006). "Calorie restriction induces mitochondrial biogenesis and bioenergetic efficiency". Proceedings of the National Academy of Sciences of the United States of America. 103 (6): 1768–1773. Bibcode:2006PNAS..103.1768L. doi:10.1073/pnas.0510452103. PMC 1413655. PMID 16446459. ^ Larsen PL (October 1993). "Aging and resistance to oxidative damage in Caenorhabditis elegans". Proceedings of the National Academy of Sciences of the United States of America. 90 (19): 8905–9. Bibcode:1993PNAS...90.8905L. doi:10.1073/pnas.90.19.8905. PMC 47469. PMID 8415630. ^ Helfand SL, Rogina B (2003). "Genetics of aging in the fruit fly, Drosophila melanogaster". Annual Review of Genetics. 37: 329–48. doi:10.1146/annurev.genet.37.040103.095211. PMID 14616064. ^ Sohal RS, Mockett RJ, Orr WC (September 2002). "Mechanisms of aging: an appraisal of the oxidative stress hypothesis". Free Radical Biology & Medicine. 33 (5): 575–86. doi:10.1016/S0891-5849(02)00886-9. PMID 12208343. ^ Sohal RS (July 2002). "Role of oxidative stress and protein oxidation in the aging process". Free Radical Biology & Medicine. 33 (1): 37–44. doi:10.1016/S0891-5849(02)00856-0. PMID 12086680. ^ Rattan SI (December 2006). "Theories of biological aging: genes, proteins, and free radicals" (PDF). Free Radical Research. 40 (12): 1230–8. CiteSeerX 10.1.1.476.9259. doi:10.1080/10715760600911303. PMID 17090411. ^ Pérez VI, Bokov A, Van Remmen H, Mele J, Ran Q, Ikeno Y, Richardson A (October 2009). "Is the oxidative stress theory of aging dead?". Biochimica et Biophysica Acta. 1790 (10): 1005–1014. doi:10.1016/j.bbagen.2009.06.003. PMC 2789432. PMID 19524016. ^ Kader AA, Zagory D, Kerbel EL (1989). "Modified atmosphere packaging of fruits and vegetables". Critical Reviews in Food Science and Nutrition. 28 (1): 1–30. doi:10.1080/10408398909527490. PMID 2647417. ^ Zallen EM, Hitchcock MJ, Goertz GE (December 1975). "Chilled food systems. Effects of chilled holding on quality of beef loaves". Journal of the American Dietetic Association. 67 (6): 552–7. PMID 1184900. ^ Iverson F (June 1995). "Phenolic antioxidants: Health Protection Branch studies on butylated hydroxyanisole". Cancer Letters. 93 (1): 49–54. doi:10.1016/0304-3835(95)03787-W. PMID 7600543. ^ "E number index". UK food guide. Archived from the original on 4 March 2007. Retrieved 5 March 2007. ^ Robards K, Kerr AF, Patsalides E (February 1988). "Rancidity and its measurement in edible oils and snack foods. A review". The Analyst. 113 (2): 213–24. Bibcode:1988Ana...113..213R. doi:10.1039/an9881300213. PMID 3288002. ^ Del Carlo M, Sacchetti G, Di Mattia C, Compagnone D, Mastrocola D, Liberatore L, Cichelli A (June 2004). "Contribution of the phenolic fraction to the antioxidant activity and oxidative stability of olive oil". Journal of Agricultural and Food Chemistry. 52 (13): 4072–9. doi:10.1021/jf049806z. PMID 15212450. ^ Boozer CE, Hammond GS, Hamilton CE, Sen JN (1955). "Air Oxidation of Hydrocarbons.1II. The Stoichiometry and Fate of Inhibitors in Benzene and Chlorobenzene". Journal of the American Chemical Society. 77 (12): 3233–7. Bibcode:1955JAChS..77.1678G. doi:10.1021/ja01617a026. ^ "Global Antioxidants (Natural and Synthetic) Market Poised to Surge From USD 2.25 Billion in 2014 to USD 3.25 Billion by 2020, Growing at 5.5% CAGR". GlobalNewswire, El Segundo, CA. 19 January 2016. Retrieved 30 January 2017. ^ "Why use Antioxidants?". SpecialChem Adhesives. Archived from the original on 11 February 2007. Retrieved 27 February 2007. ^ a b "Fuel antioxidants". Innospec Chemicals. Archived from the original on 15 October 2006. Retrieved 27 February 2007. ^ Rodriguez-Amaya DB (2003). "Food carotenoids: analysis, composition and alterations during storage and processing of foods". Forum of Nutrition. 56: 35–7. PMID 15806788. ^ Maiani G, Castón MJ, Catasta G, Toti E, Cambrodón IG, Bysted A, Granado-Lorencio F, Olmedilla-Alonso B, Knuthsen P, Valoti M, Böhm V, Mayer-Miebach E, Behsnilian D, Schlemmer U (September 2009). "Carotenoids: actual knowledge on food sources, intakes, stability and bioavailability and their protective role in humans". Molecular Nutrition & Food Research. 53 Suppl 2: S194–218. doi:10.1002/mnfr.200800053. hdl:10261/77697. PMID 19035552. ^ Henry CJ, Heppell N (February 2002). "Nutritional losses and gains during processing: future problems and issues". The Proceedings of the Nutrition Society. 61 (1): 145–8. doi:10.1079/PNS2001142. PMID 12002789. ^ "Antioxidants and Cancer Prevention: Fact Sheet". National Cancer Institute. Archived from the original on 4 March 2007. Retrieved 27 February 2007. ^ Ortega R (December 2006). "Importance of functional foods in the Mediterranean diet". Public Health Nutrition. 9 (8A): 1136–40. doi:10.1017/S1368980007668530. PMID 17378953. ^ Witschi A, Reddy S, Stofer B, Lauterburg BH (1992). "The systemic availability of oral glutathione". European Journal of Clinical Pharmacology. 43 (6): 667–9. doi:10.1007/BF02284971. PMID 1362956. ^ Flagg EW, Coates RJ, Eley JW, Jones DP, Gunter EW, Byers TE, Block GS, Greenberg RS (1994). "Dietary glutathione intake in humans and the relationship between intake and plasma total glutathione level". Nutrition and Cancer. 21 (1): 33–46. doi:10.1080/01635589409514302. PMID 8183721. ^ Dodd S, Dean O, Copolov DL, Malhi GS, Berk M (December 2008). "N-acetylcysteine for antioxidant therapy: pharmacology and clinical utility". Expert Opinion on Biological Therapy. 8 (12): 1955–62. doi:10.1517/14728220802517901. PMID 18990082. ^ van de Poll MC, Dejong CH, Soeters PB (June 2006). "Adequate range for sulfur-containing amino acids and biomarkers for their excess: lessons from enteral and parenteral nutrition". The Journal of Nutrition. 136 (6 Suppl): 1694S–1700S. doi:10.1093/jn/136.6.1694S. PMID 16702341. ^ Cao G, Alessio HM, Cutler RG (March 1993). "Oxygen-radical absorbance capacity assay for antioxidants". Free Radical Biology & Medicine. 14 (3): 303–11. doi:10.1016/0891-5849(93)90027-R. PMID 8458588. ^ Ou B, Hampsch-Woodill M, Prior RL (October 2001). "Development and validation of an improved oxygen radical absorbance capacity assay using fluorescein as the fluorescent probe". Journal of Agricultural and Food Chemistry. 49 (10): 4619–26. doi:10.1021/jf010586o. PMID 11599998. ^ "Withdrawn: Oxygen Radical Absorbance Capacity (ORAC) of Selected Foods, Release 2 (2010)". United States Department of Agriculture, Agricultural Research Service. 16 May 2012. Retrieved 13 June 2012. ^ Prior RL, Wu X, Schaich K (May 2005). "Standardized methods for the determination of antioxidant capacity and phenolics in foods and dietary supplements" (PDF). Journal of Agricultural and Food Chemistry. 53 (10): 4290–302. doi:10.1021/jf0502698. PMID 15884874. Archived from the original (PDF) on 29 December 2016. Retrieved 24 October 2017. ^ Benzie IF (September 2003). "Evolution of dietary antioxidants". Comparative Biochemistry and Physiology A. 136 (1): 113–26. doi:10.1016/S1095-6433(02)00368-9. hdl:10397/34754. PMID 14527634. ^ Mattill HA (1947). "Antioxidants". Annual Review of Biochemistry. 16: 177–92. doi:10.1146/annurev.bi.16.070147.001141. PMID 20259061. ^ German JB (1999). "Food Processing and Lipid Oxidation". Impact of Processing on Food Safety. Advances in Experimental Medicine and Biology. 459. pp. 23–50. doi:10.1007/978-1-4615-4853-9_3. ISBN 978-0-306-46051-7. PMID 10335367. ^ Jacob RA (1996). Three eras of vitamin C discovery. Sub-Cellular Biochemistry. Subcellular Biochemistry. 25. pp. 1–16. doi:10.1007/978-1-4613-0325-1_1. ISBN 978-1-4613-7998-0. PMID 8821966. ^ Knight JA (1998). "Free radicals: their history and current status in aging and disease". Annals of Clinical and Laboratory Science. 28 (6): 331–46. PMID 9846200. ^ Moureu C, Dufraisse C (1922). "Sur l'autoxydation: Les antioxygènes". Comptes Rendus des Séances et Mémoires de la Société de Biologie (in French). 86: 321–322. ^ Wolf G (March 2005). "The discovery of the antioxidant function of vitamin E: the contribution of Henry A. Mattill". The Journal of Nutrition. 135 (3): 363–6. doi:10.1093/jn/135.3.363. PMID 15735064. This page was last edited on 5 April 2019, at 20:40 (UTC).